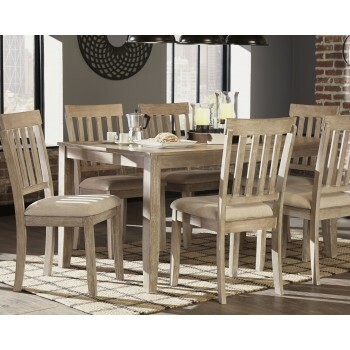 Reimagine your humble home with this farmhouse style 7-piece dining room set. Light bisque finish accentuates the natural wood grain. Grab a plate and pull up one of the good-looking chairs to sit comfortably. Supportive slat back and upholstered seat make it a pleasure to eat amongst family and friends.